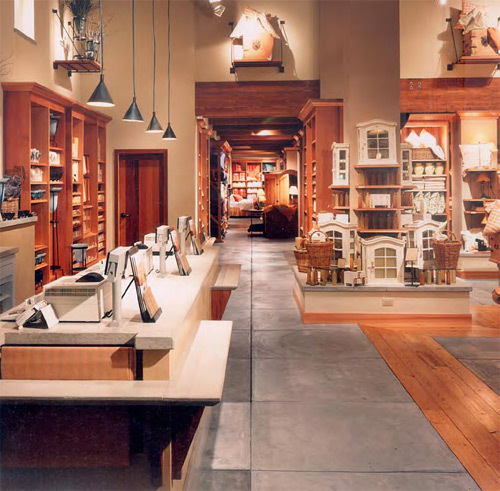 During the heyday of expansion for the Pottery Barn retail chain, Buddy Rhodes Studio was responsible for providing a number of concrete elements for the stores. Working at a total of 150 Pottery Barns during the late 1990s and early 2000s, Buddy Rhodes created concrete storefronts, cash counters, vanity tops, floor tiles and fireplace surrounds for locations around the country. Each item was made in pieces in the fabricator's San Francisco headquarters and shipped to the local builders. "We'd make blueprints, number each piece on the blueprint and number the pieces themselves," says president Buddy Rhodes. "It was like a build-by-number." The pieces were typically cast over foam to give the illusion of a thick piece of concrete, when in reality each was only 1 inch thick. The lower weight made shipping easier. Although Pottery Barn is now using limestone in new stores rather than concrete, the chain's relationship with Buddy Rhodes hasn't ended. The fabricator refurbishes any necessary elements for its 150 stores and produces pieces for expansions of those stores. Most often, it's the cash counters that need a facelift. "We put a microtopping over the top of the cash wraps," says Rhodes. "We'll go in when the stores close and rough up the surface and retrowel a skim coat over the top and reseal with our own products." When the Wyndham Oceanside Pier Resort in Oceanside, Calif., wanted an ocean blue floor for its Seabreeze Cafe and gift shop, decorative epoxy was a natural solution. Working with the general contractor, San Diego-based Life Deck Coatings Installations was hired for the job. "It really does look like the ocean," says Life Deck project manager Gil Koury, noting that the Pacific Ocean is just 100 yards away. Life Deck began the project by scarifying the surface and patching cracks with EC-72 Epoxy Patch Gel from Westcoat Specialty Coating Systems. Next the floor was given an epoxy-primer coat of EC-12, also from Westcoat. To create the ocean blue color, Life Deck applied a custom shade of Westcoat's Liquid Dazzle, a 100-percent solids epoxy floor coating system that produces a dynamic color-changing floor with its metallic additives. To finish the floor, EC-95 Polyurethane Topcoat was installed. Just as the project was about to wrap up, Wyndham decided they wanted to add images of sea creatures to the ocean floor. Life Deck hired local artist Shauna Decker to do the work. 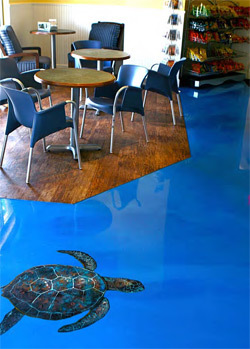 Using EC-11 Water-Based Epoxy in custom colors, Decker painted on images of starfish, octopuses and turtles. "She took our epoxy and really made it come to life," says Koury. 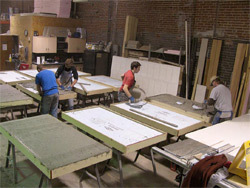 When prominent fashion designer Rachel Roy needed concrete mannequin bases to go into Macy's department stores across the country, retail fixtures leader IDX Corp. called on Chris Klipfel, at CK Concrete Design in St. Louis, Mo., to help. In total, 250 concrete bases were needed to support mannequins that would show off Roy's clothing line in the Macy's stores. The bases would match the 100-year-old concrete floor in her Manhattan studio. Klipfel and his crew created the pieces in two different runs. Each batch required 125 bases to be made in just three weeks. In order to mass-produce the bases, Klipfel had to hire two additional employees and temporarily revamp his shop to meet the demand. "Our 5,000-square-foot shop was completely broken down and redesigned to handle production, finishing, storage and shipping," he says. "Producing the pieces was pretty easy. We had a pretty basic system in place." Each base measures 4 inches by 36 inches by 72 inches. Klipfel and his crew cast each piece around 3-inch foam to keep them light enough for Macy's employees to easily move around, and they reinforced the pieces with PVA fiber. The pieces were then given a rough hand-troweling, lightly polished to bring out the aggregate, and lightly treated with a highly diluted black water-based dye from Legacy Decorative Concrete Systems to create a translucent look. "The black dye was used to highlight and provide light color shifts from black to smoky grey hues throughout the surface," Klipfel says. Finally, they were sealed with a polyaspartic polyurea from Flexmar Coatings LLC. Roy and IDX wanted the bases to be reminiscent of a worn, old concrete floor. "This was not a normal finished piece of concrete," Klipfel says. "She (Roy) didn't want perfection. It has visible trowel marks, the finish is dotted with exposed aggregate and it has bug holes. It's the most intentionally unrefined concrete I've ever produced. It was like the worse it got, they more they liked it." Once all the bases were assembled, they were sent to a metal fabricator in St. Louis to be fitted with wheels and parts for the mannequins. Then they were shipped to cities that have Macy's stores. Although making 250 concrete mannequin bases could have been a challenge, the project went smoothly, in part because of IDX, the retail fixtures company. "IDX is probably one of the best clients we've ever worked with as far as how they do things, the order in which they do them, and in terms of making tight decisions like final coloring," Klipfel says. "They are fantastic at taking care of all the details." Contractor: Mark Beamish Waterproofing Inc. 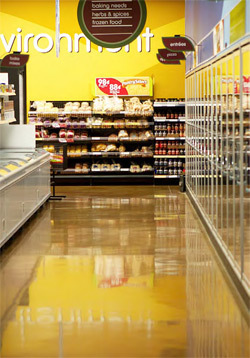 When Fresh & Easy Neighborhood Market Inc. started building in Southern California, several general contractors asked the grocery store chain's design team to consider Mark Beamish Waterproofing Inc. as an approved vendor for polished floors in new locations. "They thought Fresh & Easy would be really satisfied with our work," says Mark Beamish president Adam Beamish. As it turns out, the general contractors were right. Mark Beamish Waterproofing has now worked on 50 Fresh & Easy floors in the Western region, mostly in Southern California but also in Northern California and Arizona. For each store, Beamish and project manager Matt Hess conduct a preconstruction meeting to address imperfections in the concrete or any other concerns. "As we've begun to perfect the process we're finding that communication upfront is key for setting expectations," says Beamish. "If we have one bad floor, we're out. We point out some areas that may show some slight imperfections, and make everybody aware of everything." The size of each store ranges from 13,000 square feet to 15,000 square feet, which includes the sales floor and back rooms. The sales floor is polished and stained, while the back areas are only treated with a sealer. Mark Beamish is given approximately seven days to complete each store. 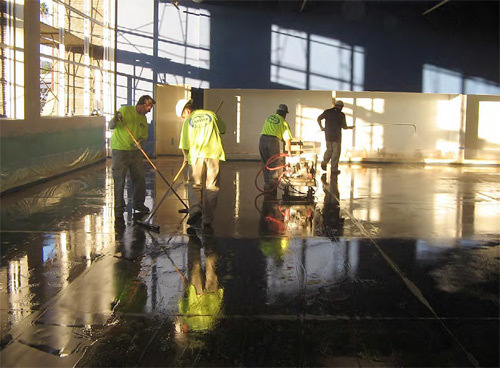 They begin by polishing the floor with a 50-grit resin pad, then 100-grit and 200-grit pads. Next they apply Stain-Crete from Increte Systems in Amber, a custom color designed for Fresh & Easy. After the stain application, RetroPlate 99 is added to the floor as the hardener and sealer. To finish, the floor is given a 400-grit polish, treated with RetroGuard and burnished to a high shine. Joints are filled with Spal-Pro RS 88, a polyurea manufactured by Metzger/McGuire in a Mocha color that, again, was developed for Fresh & Easy. "The color matches the stain exactly," says Beamish. "That's something we pay particular attention to." Many of the Fresh & Easy floors in the beginning of the relationship were simply polished gray concrete, but as the grocery store chain evolved, color came into the picture. "The newer stores are going with a stained and polished look for the sales floor," says Hess. In addition, many of the floors were remodels at the beginning. Now new concrete is poured for nearly every store. "The thing that has made it easier for us is that Fresh & Easy and the general contractors have come to understand the process, and the expectations are clear now," says Beamish. "They know what it takes to have it ready for us to get in there and do the best floor possible."